The new writer of Doctor Who says he would not object to the hit TV series being made into a film. 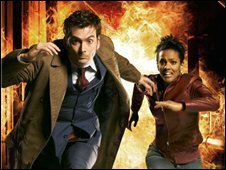 Steven Moffat, who has replaced Russell T Davies at the helm, said it would be good to see the show at cinemas as long as it was "great and fantastic". But he stressed any filming should not get in the way of making the series. He also revealed Steven Spielberg was a Doctor Who fan and that Lord of the Rings director Peter Jackson had one of ex-Doctor Sylvester McCoy's outfits. Moffat is taking over from Davies, who revived Doctor Who in 2005, as the lead writer and executive producer for the fifth series of the show - due to be shown on BBC1 in spring 2010. Asked at the Edinburgh International Television Festival whether he would like to see the series become a film, he said: "I'm not against it. I don't think it's the most important thing for Doctor Who. "A movie is one 90 minutes a year. So yes, so long as it never gets in the way of the show. If it gets in the way of the show that's appalling. "It's been in the cinema, with Peter Cushing. It would be good to see it in the cinema so long as it's great and fantastic." Moffat has already written some of the most memorable Doctor Who episodes of recent times including Blink, of series three - which featured terrifying weeping angels - for which he picked up the best writer Bafta earlier this year. He was previously known for the landmark ITV children's drama Press Gang and Coupling, the award-winning sitcom he created and wrote for BBC2. Moffat went on to rule out introducing an older Doctor Who, if and when David Tennant leaves the show. "It's a practical issue. This is a show that's hard for even the young, super-fit David Tennant to keep up with. It might kill someone over 60," he said. "If the Doctor turned into an old man you would be a bit p***** off. Even William Hartnell [the first doctor] had trouble back then, he was often ill and forgot his lines. "I think he'll always probably tend to be around 40." Writer Davies will remain in charge of four Doctor Who specials to be shown in 2009.